Nadja Michael as Salome Royal Opera House, London, 2008 ROH © Robbie Jack - Corbis. Ensemble in 'Spaceship' at the dress rehearsal of Einstein on the Beach Philip Glass in collaboration Robert Wilson Dorothy Chandler Pavilion © Lawrence K. Ho Los Angeles Times Getty Images. 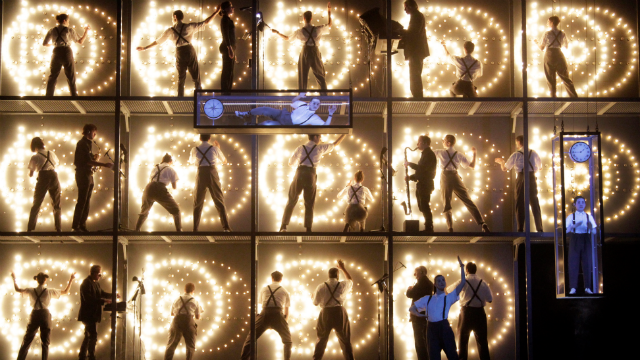 What’s the best way for opera to gain new audiences? The most obvious answer is to encourage new audiences to see an opera and hope that they will enjoy the story, music and singing all at once. Then we have to ask ourselves another question: what are the best operas to show someone who is completely new to the art form? The Victoria and Albert Museum has taken on the responsibility of introducing opera to newer audiences using an entirely different technique. A brand new exhibition with the collaboration of Covent Garden’s Royal Opera House (and Société Générale) has opened at the Sainsbury Gallery. It is the first time the Sainsbury Gallery has exhibited work and artefacts to this scale – the largest in Europe of its kind. 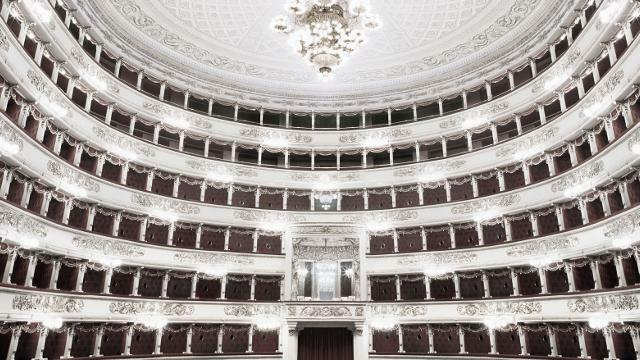 Opera: Passion, Power and Politics requires 70 minutes of your time, as written on the entrance wall of the exhibition. Visitors are handed a pair of headphones for a 4D experience of opera seen through key moments in history, beginning with Renaissance Italy to today’s premieres. To its curator Kate Bailey, international opera director Robert Carsen and the ROH’s Music Director Antonio Pappano, this includes 300 extraordinary objects across seven operatic premieres in seven cities. For those who know the opera catalogue, the exhibition breaks it down with Monteverdi’s L’incoronazione di Poppea (1642), Handel’s Rinaldo (1711), Mozart’s Le nozze di Figaro (1786), Verdi’s Nabucco (1842), Wagner’s Tannhäuser (1961), Strauss’ Salome (1905) and Shostakovich’s Lady Macbeth of Mtsensk (1934). This is just Pappano’s, Carsen’s and Bailey’s choice of operas, though. Other directors and curators in the field may think of another selection. As one moves within the exhibition, arias and duets from these operas would emanate from their headphones. Recordings by the ROH Chorus singing Va pensiero from Nabucco and the love duet Pur-to-miro from Poppea, sung by Danielle di Niese and Alice Cootes, are part of the auditory experience and there’s much more to see and hear here. Delicately designed bottles and goblets ‘probably’ from Venice in the 1600s open up the exhibition to illuminating costumes from Monteverdi’s earlier productions. Then there’s the musical instruments, lutes, and theorboes which are used to perform Monteverdi’s music. Surrounding each new era and new opera there would be stylish post-it notes of the different arias, recitatives, synopsis and character sheets set on the gallery’s walls. Moving onto Handel’s England, a traditional coat worn by a man in the 1700s was on display, including a cooling fan with a drawing of the Haymarket Theatre in 1705. To highlight the influential prowess of the music genius Wolfgang Amadeus Mozart, the V & A provide the same piano played by the composer in Prague, 1787. His Marriage of Figaro (Le nozze di Figaro) premiered in Vienna the year before that. In Paris, Wagner made history. Definitions of Gesamtkunstwek (total work of art) are defined on the gallery’s wall in white, and the significant inspiration he made on writers and artists can be seen through his premier of Tannhäuser in 1861. Moving along the exhibition, there’s video footage of soprano Nadja Michaels as Salome in the Royal Opera House’s 2008 production of Strauss’s own opera. Aubrey Beardsley’s Illustrations of Salome were all part of the Aesthetic Movement of 1872, which was shared with Oscar Wilde, the author of the original biblical tale of Salome. Rarely seen outside of Russia, there’s the art work Shostakovich’s First Symphony in the form of a painting by Pavel Filonov. There’s also a newsreel of the composer himself writing his opera, Lady Macbeth of Mtsensk in 1933, where he managed to make Stalin so angry that the opera was censored. Now, having delved deep into the material of the politics, power and passions involved in opera’s history, would someone new to opera feel more compelled to book tickets at their local opera house after seeing this exhibition? From what the exhibition has to offer, not necessarily. In this case, the exhibition provides a context to the story of opera; how opera grew in the space of cultural history, yet there are so many ideas, historical facts and points missing. How about going further and providing a bit more clarity on the role of the baritone or tenor? Or how the relationship between the conductor, the soloist and orchestra work? And even how the staging impacts an opera performance, or how singers train to become world-class opera performers? We may even ask, why there wasn’t more mention of other international opera houses? The list goes on. I can appreciate that there is a limit to how much can be addressed with such a broad topic for any particular exhibition, but even writing as someone who knows a little bit more about opera I felt that it failed to present the captivating part of the opera genre. Listening to opera and bouncing from one corner to another corner of the gallery to read more historical information on objects from a particular era doesn’t go as far as encourage people to become more curious of opera, it only tells you more about the time and social setting of when the opera was written and had its premiere. Perhaps, the best way to exhibit opera is to leave it at the opera house or concert hall, where operas are regularly performed. There you can see the true life of opera.